Every once in a while you wind up in a quaint spot you wish you could replicate closer to home. That was the way we felt after a casual lunch at L’Instant Fromage, a cheese bar in Lyon—actually, the only cheese bar in Lyon. Lyon is known as the gastronomic capital of France for many reasons, but among them are its delicious cheeses. On our first evening in the city, Laur and Jacques, a local couple we had met at dinner in our hotel, graciously gave us a short list of their favorite restaurants. They highly recommended a cheese bar a few blocks away, which sounded like a nice change of pace after engaging in a series of very serious (and wonderful) meals. Entering L’Instant Fromage, we were struck by its bright colors, whimsical décor and welcoming ambiance. There were mismatched oilcloth tablecloths with polka dots and checks on the tables, with hanging pendant lamps from the 70s overhead. A smattering of vintage antiques and collectibles were strategically placed around the room. Wherever I glanced, there was something that caught my fancy–from the cute blackboard diagram for making cheese choices posted over the bar to the loaves of French bread curiously stored in champagne crates. In this tiny place, two young, English-speaking owner/chef/waiters create memorable cheese plates that kill! One entire wall was lined with slate boards listing all the cheeses available that day, organized under three categories: Les Brebis (sheep), Les Chèvres (goat) and Les Vaches (cow). In classic Lyonnais fashion, we started by ordering Le Pot Lyonnais, a carafe of local wine (usually Beaujolais or Côtes-du-Rhône) that’s served in a 46 cl. (roughly a pint) bottle with a weighted glass bottom. For light drinkers, it’s inexpensive and totally right-sized. There were some thirty different cheeses to chose from. For about $20 USD, we opted for a mixed plate with five different kinds. Since the only varieties we were familiar with were Comté (the most popular cheese in France that’s even sold in Costco in the States) and Saint Marcellin (which seemed to be ubiquitous in Lyon), we were happy that our friendly and far more knowledgeable server offered to compose a cheese plate for us. The cheeses arrived on a slate board with little toothpick flags identifying them. Each cheese was accompanied with by a different jam, jelly, or mound of nuts or fried onions. With big eyes, we also ordered the lunch special for about $15USD, a scrumptious tartine (an open-faced sandwich) with fresh greens, pesto, ham and melted Comte cheese. It was so much fun to taste and compare the cheeses over our “Pot” of wine. Consistent with the theme, even the bill arrived in a cheese box. L’Instant Fromage is a great concept, well-executed. It’s a comfortable spot with heavenly cheeses, reasonable prices, and an excellent wine list (by the glass or by the bottle). Next time we’re in Lyon, we would return in a heartbeat! Since this was our first cheese bar, I checked to see if there were others in New York City and found one. Murray’s Cheese Bar in the West Village of Manhattan is now on our list of destinations to try closer to home. Like many shops and restaurants in Lyon, L’Instant Fromage closes between lunch and dinner so be sure to check its opening hours. Because seating is limited and the place is popular, reservations are usually necessary. We made ours online through the website. When in Lyon, try “Le Pot Lyonnais” and local cheeses. This is a great place to sample them and choose your favorites. I’ve definitely added L’Instant Fromage to my list for my next trip to Lyon. It sounds somewhat akin to a Ploughman’s Lunch – one of my fave lunches in England. The decor at L’Instant Fromage is super cute and looks very playful – it’s nice to see a place that doesn’t take itself too seriously but delivers an incredible experience. Love that cheque in a cheese box! And I have to visit Ploughman’s Lunch! Will you still be there then? We’re back home (sadly) but it’s a wonderful city in terms of art and culture, Linda. There is also a biennial contemporary art festival in Lyon as well. L’Instant Fromage sounds and looks great. It reminded me a little of Salt Tasting Room in Vancouver, British Columbia. The decor in Salt Tasting Room is a little more industrial looking, but what is available daily is listed on chalk boards. It specializes in artisan cheeses and small-batch cured meats, paired with wines, beers, and sherries. I don’t know of anything similar in my home town of Winnipeg. Coincidentally, I was at the Tasting Room in Vancouver. Perhaps, because we visited at night, it seems more sophisticated and trendy than L’Instant Fromage. I enjoyed that too, though. It was fairly empty the mid-week evening I visited. I was at their Kitsilano location in October 2013. OMG, my favorites: bread and cheese! What a fantastic place to find in Lyon. I will refer to this post should I find myself anywhere near there! And French bread is always magnifique! mmmm….. cheese. What’s not to love?! The french definitely know their stuff! Bread, cheese and olives is one of our favorite plates for a meal or just a snack. Looks so cozy and quaint. The food looks incredible. I can definitely see why seating is limited. I love most cheeses except Brie, however, it always tastes good in France! What fun to get a recommend from someone you happened to meet, about a place that was so colorful and tasty. This brings back memories of when we had lunch in an out of the way place with our 6 month grandson in tow. He just loved chewing on the crusty bread and we just loved tasting all the cheeses washed down by the French wine. Ahhh, memories. Being a total cheese lover, I’m sure I would love this place! And those oil cloths! Really takes you back to the age of innocence, doesn’t it? Love the pics, Irene. Sounds like what I want for dinner! Latvia is supposed to be known for its cheese, but I haven’t seen anything like this place in Lyon! Love this post…the descriptions and the beautiful photos. How about a trip to Murray’s cheese bar in NYC? How could you resist? Just name the time and day. I love cheese. I dabble in cheese making – only the simple fresh cheeses like fromage blanc, chevre, mozzarella and ricotta but it’s been fun. My idea of a grand travel adventure would be a walking cheese tour. From farm to cheese maker to cheese monger. Walk, sample, walk, sample, wine, sample and so on. This tasting looked like a little bit of cheese heaven. Thanks for sharing and the great photos. That sounds like some pretty serious cheese-making! I’m impressed! We didn’t know Lyon is the gastronomic capital of France (would have guessed Paris). Your photos and post are really making us salivate – and want to visit :-). Definitely a don’t miss, in my book! Did you say cheese bar???? I’m surprised that concept hasn’t been imported back here more than a few times. I’ve certainly had some cheese plates, but to have so much variety sounds Oh la la ! Great capture with the photos, I was tasting those cheeses along with you. The Salt Bar in Vancouver sounds interesting, we will be out there next month. Would you recommend it? Looks like a fun and colorful place to visit with lots of cheerful atmosphere! And cheese and bread … MMM! 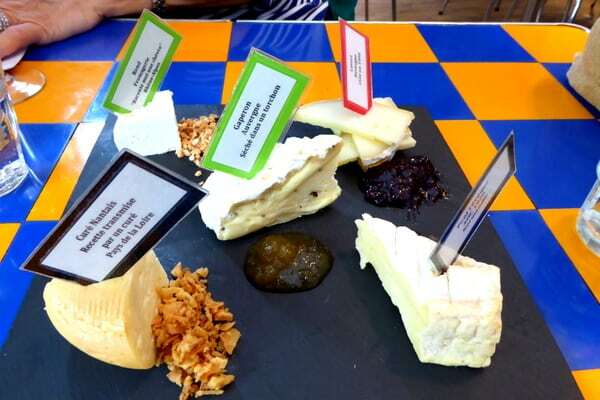 If I run into a chance to try a cheese bar during our travels I’m so there! Wish I had time to visit Lyon and this charming cheese bar before my little party on Saturday. I was already planning to do a cheese board, but next time I think I’ll add the cheese you mentioned is available at CostCo. The Compte isn’t quite as good at Costco but it will definitely be second best. :-) Hope you enjoy and your party is a huge success!